Are you looking for a best Best Tiger Park In India?? Jim Corbett National Park is one of the best tiger park in India. The park is located in Uttarakhand State and it is best known for Bengal tigers. Rituraj was more optimistic than his fiancé Divyani. His mobile camera was on selfie mode right from the time he jumped inside the Jeepsy. Divyani, was slightly practical, she took her DSLR along. Statistics speaks presence of tigers within 1-kilometer radius of the couple. They were sure to capture few never seen before pics, for their new year FB update. Accompanying them is Palash and ten others. Palash, have always lived his dream, he even tattooed his right shoulder with the giant cat few month prior to the trip to Jim Corbett National Park. His fiancé, Dhriti, who ultimately was credited for removing the decade-old "most eligible bachelor" title from Palash, was silently enjoying the ambiance. Shantanu, who was dressed like an 18-century hunter, became a self-proclaimed bio-scientist in the morning by certifying the age of an elephant dung through a newly invented smell-taste method. Beside him was his ever charming wife Janu. She became an asset for the resort and liability to Shantanu as she only eats 1/4th of the full meal paid to the resort. Our 4 year's old elder daughter Volley was stuck to her favorite Divyani didi like a favicol. The last wildlife enthusiast on the first vehicle was none other than Rituraj's brother-In-Law, Anmol who actually sacrificed to become the un-official candid photographer of the team. On the other Jeepsy was Partha, who carried a naga knife in case he spot some red jungle fowl, he was more concerned of the dinner menu than spotting a tiger in Jim Corbett National Park. Anant's wife Priya, was holding his hand strong, after her frightening morning walk experience (to be elaborated later). Rrithvi, our younger daughter was sitting beside Partha with a pocket full of stone, to protect herself in case any wild animals attack her. Our Help Maromi was honored with the most unsought after seat on a jungle safari i.e the front seat of the jeepsy. Priyanka, my wife was standing in the jeep, throwing her eyes and ears in all direction, to make sure that she is the first to spot the tiger. I was sitting beside her, eagerly waiting to witness a million dollar scene, the caption of which would be none other than "When the tigress meets the tiger". 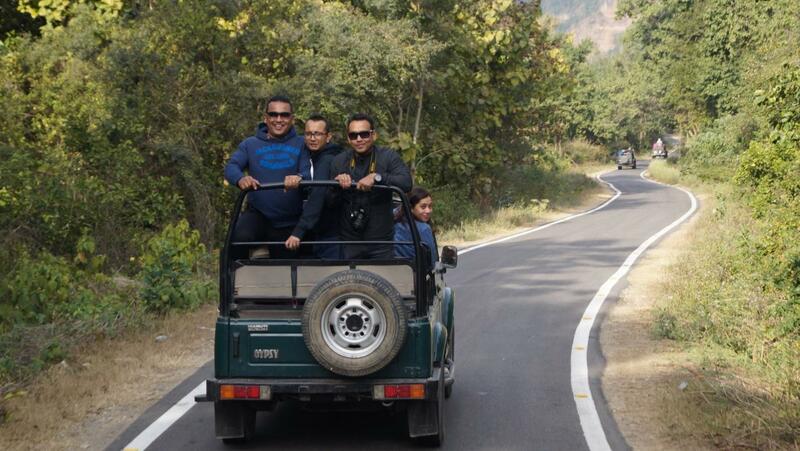 The convoy of two Jeepsy, loaded with part-time wildlife enthusiast, was gearing up to enter the most protected area of Jim Corbett National Park. Already, the excitement was at an all-time high after spotting two peacocks dancing on the other side of the river. A week earlier, the team zeroed in on Corbett Holiday Resort, after much permutation and combination of availability, facilities, and budget. Every year on the eve of New Year this gang of twelve friends will be found, either in the hills, jungle or near a river of Uttrakhand. In the last few days preceding the D- day, the WhatsApp group was flooded with thousands of msg. I wondered if any of the office bosses, happen to check these msg, he/she is sure to deduct five days salary. This time, an addition of two brand new white Maruti Beleno car was adding to the excitement. At 5.15am on 30th Dec the Dwarka, family (Mr. and Mrs. Shantanu) posted the first msg announcing their departure. The Ghaziabad family was still fast asleep. The family from Faridabad was on their way to Lajpat Nagar where four more families to meet at 6 am. One hour later, it was a war between the late ladies and before timers. 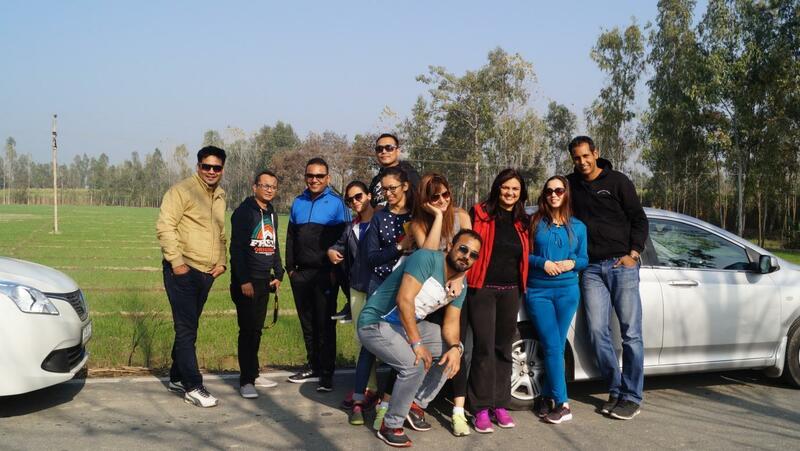 At 8.30am, the team finally met at a Dhaba, after crossing the first toll on the Delhi -Moradabad highway. The fog played hide and seek till the team reached Moradabad. The breakfast was stuffed parathas, dal, day, butter, gram chai at a Dhaba. The witticisms and mischief from all the group members further added to the taste of the parathas. After Moradabad, it was unanimous decision to follow the Google lady than to depend on our own expertise. Truly, Google took us through an amazing road giving us enough opportunity for a photo shoot along the yellow mustard fields and green poplar trees. Every time the road takes a turn we expect a milepost directing us to Jim Corbett National Park, but our wait continued. It was already 1 pm, so we decided to call our resort people worrying about our paid lunch. They assured to wait till 3.30pm. Finally, it was all forest and no houses, giving us the feeling of arrival. But, suddenly Palash Google, directed us to take a left turn with no further road ahead. Once Palash Google failed, it was finally Priyanka's google which led us to our destination on the Nainital Highway. As we took a left turn entering the narrow road from the highway, it gave us a sensational feeling. The road took us along a farm full of peas and potato cultivation. There were hardly any houses. A forest was visible at a distance. We continued driving across a mango orchard. As we opened the car window we would felt the winter sun. At the dead end of the road was the gate of Corbett Holiday Resort. Next to the boundary wall of the resort was the jungle. The resort opened up to our expectation, same like the picture perfect cottages on the website with the swimming pool and ample green area in the background. There were facilities for indoor sports like table Tennis, snooker, carom, chess, do, etc. We were 13 person but rooms were booked online only for 9. The resort manager took care of us, assuring a room for the first night and extra beds for the second night. A veg lunch was waiting for us and we did justice to it. The cottages were super spacious, more like a suit with a drawing room and a bedroom with all facilities. I thought everyone would take a nap before coming out for tea. Through the glass window, I saw Palash in his track suit getting ready to play badminton. Before I would come out, the badminton court was occupied, with one couple in waitlist. The resort atmosphere was so appealing that no one felt like spending time inside the room. The next two hours till sunset was non-stop badminton, volleyball, and cricket. Even Priya, who hardly play games, was seen in the ground running after to catch the tennis ball like the way one catches a football. Valley and Rithvi were busy with the ducks at the backyard of the resort. Tea was served on the ground with delicious bakery biscuits, making us feel like Englishmen. Partha was busy managing resources for the dinner. He was getting restless to explore the local market in search of some good raw non-veg stuff. Arrangement was made so that he can cook some item near the fire at night. Three of us went out to the local market, the demand list was huge from coke to local fish. We found everything except for Kinder Joy, demanded by the kids. At 7.30pm, the night was still young. With no shortage of firewood, the party started around the fireplace. In the next 5 hours, all the frustration of the year gone by was kicked out, with only humor, wine, kababs, fire and moonlight for our company. The jungle safari scheduled at 5 am the next day was ruled out even before we retired for the day. Next day, we woke up to sound of birds. 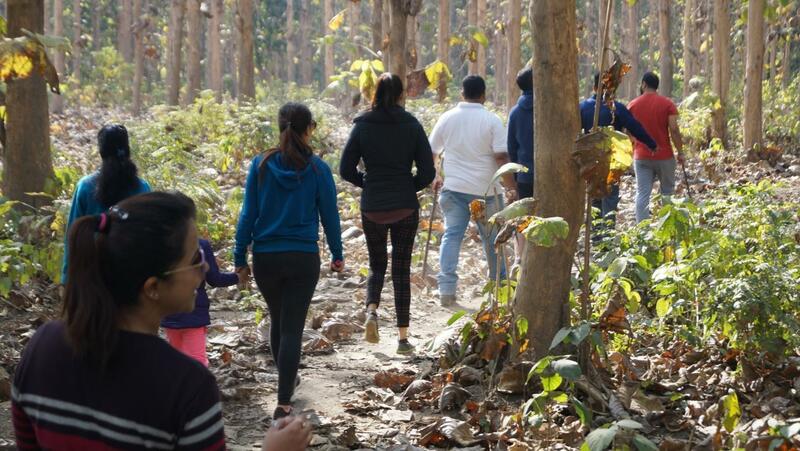 We had tea and went out on a walk through the Jim Corbett National Park.Inside, the jungle we met a lady, who was collecting firewood. She narrated a story of how a leopard attacked her daughter and eventually how her husband had a fight with the leopard and rescue their daughter. After listening to her story, we kept walking deep inside the jungle in search of some excitement. As we took a turn, suddenly we heard a strange sound from behind. We realized something was moving inside the bushes. We came close to each other holding our hands. As the movement increased, we started running. It was a run off or life.The fear was visible on everyone face. Divyani was about to faint. Only when she saw Rituraj coming out of the bushes, she found some relief. Rituraj succeeded in playing the biggest prank of his life, taking 12 adult and 2 kids as hostage. During this episode, Anant was found running in the front, leaving Priya behind. This was the reason why Priya was not leaving Anant's hand during the entire jeep safari. But, later we got to know that Anant was a partner in crime with Rituraj. Returning back from the Jim Corbett National Park, we seat with the resort watchman, he narrated a story of a tiger entering their house. Before lunch, we had an hour of spare time, which was gainfully utilized by diving into the freezing cool swimming pool. The newly crowned bio-scientist took the led, forcing others to ultimately take the plunge. Over lunch, the waiter too shared a tiger story with us. After listening to all these inspiring tiger stories Rituraj jumped into the Jeepsy confident of clicking a selfie with the king of the jungle. As we entered one of the gates of the Jim Corbett National Park, the Jeepsy driver too shared a story of how a tiger once chased his jeep and then run away upon hearing the loud sound of the horn. The biggest surprise was waiting for us inside the Jim Corbett National Park. There was a traffic jam. For a moment I left like all the Jeepsy ever manufactured by Maruti are running inside the park. There was more vehicle than usually found in Lajpat Nagar market on a weekday..! It was a weekend and that too on 31st Dec 2016. There was a mad rush of tourist and if at all a tiger was witnessing this from a hill top, I am sure he won't come down to that spot for the next six months. Apart from the vehicles, the other thing that was in plenty was the high-quality DSLR cameras. In every jeep, it seems there was an award winning wildlife photographer. While returning back, it was almost dark. We all were shivering in the open Jeepsy when we finally spot two deer and a wild elephant. The upset of not spotting a tiger was temporary because there was a 31st Dec night to celebrate. That night we all shared our own tiger stories of happiness, bravery, triumph and accomplishment, welcoming the new year with new hope. 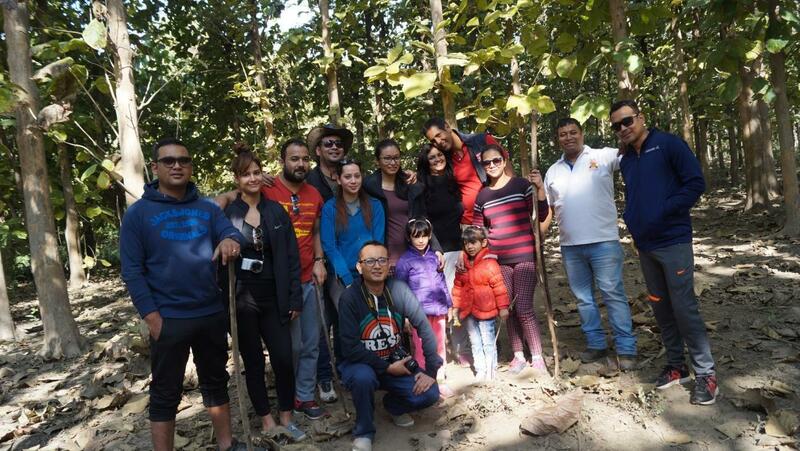 One thing we learned from the tiger stories of Jim Corbett National Park is that there is a story hidden in everyone's life, whether we make it painful, interesting, happy or adventurous, the choice is ours. I love the traffic jam part in the Tiger Park. Wonderfully jotted down as always. Corbett National Park is the best national park all over India for viewing tigers. Located in the foothills of Himalayas within Uttarakhand, it provides pleasant environment for tigers as well as visitors. Moreover, awesome guest houses and luxurious hotels are present inside and outside which provide great comfort.